Create Me 365: Is Gouache Toxic? I've heard that some people lick their brush to shape it to a point. 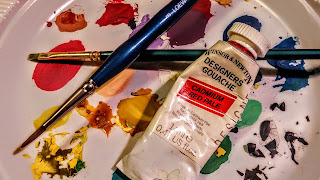 Since most watercolor and gouache paints are listed as "non-toxic", that should be safe to do. But is it? What does "paint toxicity" mean for scribes? How much paint does it take to be considered toxic...one lick or do you have to eat a whole tube? What if you make your paints from a powder? The short answer is...when metal pigments are consumed they accumulate in body tissues and never leave. Especially, paints containing metal pigments such as lead, titanium, cadmium, barium and any 'metallic' color. Those metallic compounds are processed like food nutrients and spread around the body. But, they are never removed, so they build up over time. While a brush-full of metallic pigment may not harm an average healthy person, repeatedly exposing yourself to very small metal amounts over 20+ years may harm you. Artist paint manufacturers do not intend their paint to be consumed, so they haven't done studies to see if doing that is harmful. They don't know what consuming small amounts of non-toxic paint over twenty or more years will do to your body. I'm a healthy scribe, but I have inherited a condition that makes my blood "thick". That means I'm not a typical person. I'm different in more ways than my brothers' taunted me. There's no way I can be sure even licking my brush to point it will be safe after years doing that. I don't want to gamble on it either. I could be more resistant to metal's effects than most. But, I don't want to tempt fate and shorten my life or receive a life-long debilitating condition because I often licked my brushes. I paint with cadmium pigments because they have beautiful, strong oranges, reds, and yellows, but I don't make them from dry powder. I don't teach paint making with them either. It's too easy to accidentally ingest or inhale dangerous powder amounts. Even if the pigment powder is an inactive talc, inhaling it may cause serious long-term breathing problems. Heavy metal poisoning is a lousy way to die. Before the metal levels are fatal your liver and brain are seriously defective. Near death, your lungs fill with fluid. It takes self-awareness to quit twirling your brush's moist, soft bristles through your lips to make that perfect point. I have an alternative trick to point small, round gouache brushes. I gently pull my brush tip through a little hole I make by putting my index and middle finger together with my thumb. This works as well as pointing my brush tip with my lips and is safer, too.